Jul. 24, 2014 12:00 p.m.
Communities are made up of wonderful people, and we are deeply saddened by the loss of one we called ours for many years – Laurence ‘Laurie’ Linaker. If I could describe Laurie in just a couple words, I would have to say dedicated and loving. Laurie came to the Millet area in 1971 when he and Barb settled into the farm just west of Millet. Quickly they became involved in the community as they now had five children to raise. Both Laurie and Barb had strong family values, and they made sure their time would be spent keeping track of the five kids, not to mention the cats, dogs, cows, horses and friends. Barb tells the story of how at night her and Laurie would count shoes to see how many would be there for breakfast in the morning. Laurie believed you could not have only ‘one’ of anything; everything needs company. Laurie LOVED kids and has touched the lives of many who got to know him through the years. Laurie resigned from Edmonton Transit System and opened a hardware store which allowed him lots of time with the family. As time passed, he became deeply involved in sports, hockey, and ball and often Barb went one way and Laurie another, both with a car load of kids. 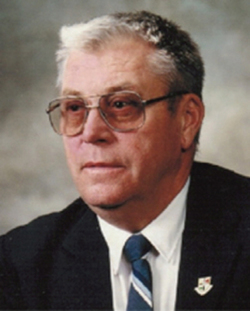 When the Hardware store closed, Laurie served three terms as a Wetaskiwin County Councillor and as the School Board Chairman. Around that time, Laurie and Barb had raised the kids and retired in Millet. Shortly thereafter, Laurie got involved in town politics and served on council for 3 terms and mayor for two. Laurie was a dedicated community person, serving many years with the Millet Volunteer Fire Department, was a charter member and lifetime member of Millet & District Lions Club, was the community Santa for many years, and a volunteer bus driver whenever given an opportunity( which by the way added up to thousands of hours). He was an inspiration, a wealth of knowledge, a fair and giving soul to those who knew when they needed a shoulder; his were big enough to share and he would always be there. I cannot complete this without talking about his sense of humour. It was as large as Laurie’s life. He loved to laugh, never missed a good party, loved to tell a good joke and his smile will never be forgotten! Laurie has many accolades and honours to his name and was well deserving of each and every one. In 2007 Laurie and Barb moved to Pilot Mound, Manitoba. Laurie grew up just down the road in Clearwater, Manitoba, so this was going home for him. He had an opportunity to explore his love of trains again, meet old friends, walk down his childhood streets, and become involved once again in a community that would love and support him as much as we did in Millet for 36 years.